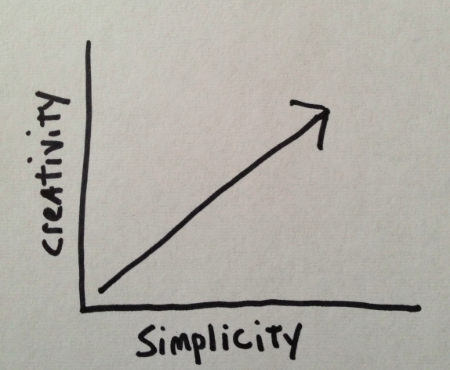 Simplicity Liberates Creativity. Complexity strangles it. Nothing creative in advertising has ever been born out of complexity. Extensive experience has taught me this, and not just once, but over and over again. I’d risk saying complexity rarely yields brilliance in any creative field. Maybe it works for intricate art pieces or elaborate symphonies, but when you’re trying to grab people’s attention with something that will be one of 10,000 messages they see in a day, it better be simple. But complexity is a disease in the industry. Every step of the way, the project gets more complicated, with unnecessary meetings, additional opinions (that usually don’t add anything), inordinate amounts of processes and semantics and acronyms, last-minute comments from higher-ups, and political agendas being played out in the work. By far, complexity slays more good ideas than any other issue. Why? It’s incredibly difficult to be creative when you’re bound in chains of endless boxes to be ticked, in a straightjacket of contradictory points of view. It becomes impossible for creative greatness to make a Houdini-like escape from these shackles. I think down deep, we all know complexity gets in the way of greatness. So why can’t we stop it? The simple answer: it’s hard. We all want to add something to the project to feel we’ve contributed. And if we cut something out, inevitably someone will be angry that his or her stuff isn’t included. We also don’t want to eliminate things we deem important to the consumer. But when everything is important, that means basically nothing is important because it all becomes of equal importance. Complexity often hides the fact that we really don’t have a clear idea. We shroud the work in convolutedness, and hope no one will notice. Also, when it’s our money on the line, suddenly all rational thinking goes out the window. If we’re paying for it, then of course people want to hear it, and not only it, but ALL of it, every last benefit there is. We have a hard time thinking how we behave when viewing other brands’ work. We give it zero attention unless it demands it. So what’s the result? Rampant complexity in a world where simplicity should reign. When we start from a place of simplicity, creativity thrives. Great brands understand this…the Apples and Nikes and Starbucks of the world. They keep the basic idea clean, simple and compelling, then let the interpretations of that idea explode out in new and stimulating directions. That’s because while simple, the idea is still fertile and provocative. Simplicity does not mean simpleton. It’s not about dumbing it down, but about smarting it up, about being more concentratedly clever, more artfully and powerfully succinct. Once there, simplicity frees ideas up to go where they never would have gone previously when shackled. Another great thing about simplicity: it doesn’t care what media it’s on. Pretty much every great execution on any media is smart, captivating and simple. That’s because when anyone working on the project, regardless of their particular expertise, can readily interpret the idea, that increases the odds of stellar output. If you buy none of my logic about why simplicity is beneficial to the “creative process” then perhaps you’ll buy this basic consumer-driven reason: people like simple. Simplicity makes it easy for them. Of the thousands of ideas flying past each day, of which they are paying very little attention mind you, simplicity gives it handles, so they can grab onto it. And let’s be honest, complexity just pisses them off. I’ve seen this dynamic hundreds of times in focus groups. When an idea is too complicated, people don’t give it the effort. Worse yet, they get angry and defensive because it makes them feel stupid, like they don’t “get it.” And then they hate you immediately…because no one wants to feel like they don’t get it. A simple rule I live by: They have to get it before they can like it. At the risk of sounding like a cheesy platitude, the most beautiful things in the world are simple. And for certain, all the best things I’ve worked on in advertising have been simple. So strive for a monk-like simplicity. And the next time you’re sitting in a meeting, and thinking why is this so hard? So complicated? Remember this simple thought: rarely does anything complex yield anything creative. Then let simplicity liberate your creativity. This entry was posted in Uncategorized and tagged Baiocco, creativity, simplicity, The BAM Connection by thebamconnection. Bookmark the permalink.